Finding the right skateboarding shoes is not an easy task. Let me tell you that. Out of the endless array of skate shoes how do you find ones that have a great board feel, are durable and actually feel comfortable on your feet? Luckily I’ve done the heavy lifting for you. Today I’ve decided to go over my favorite skateboarding shoes. These 13 models are in my opinion the best you can buy right now. After reading this guide, you should be armed with all the necessary knowledge to get the right pair. These shoes are the successor of the Etnies Marana. The Marana was an instant classic with a lot of skaters, but some demanded a shoe that was softer and had better board feel – enter the Marana with a vulcanized sole. The shoe features your basic rubber-sole fused to a seamless rubber printed toe cap. It also features a mesh tongue, collar lining and the STI Evolution foam insole from Etnies. All these features work together to provide breathability, durability, and support. The insole will absorb a lot of the impact from doing huge tricks and landing hard, but won’t be so thick that you can’t feel the board. Finally, because they are a bit softer than their older brother, these shoes break in easier and support different foot shapes well. They are considered one of the best skate shoes for wide feet. You can check them out on Amazon.com to find out more info. Whilst the classic Marana was built to be indestructible, this shoe was built with maximum performance and board feel in mind. However, they won’t last the longest because of the softer vulcanized sole. Check out the adidas Busenitz if you want a longer lasting shoe. These shoes basically put the eS brand on the map back in 1996. They were one of the first skate shoes and were worn by a lot of skate legends. They are still just as good and are preferred by loads of people today. The eS shoes are primarily made of a suede ‘upper’. Suede is a great material for skate shoes as it slides nice across the grip tape when you are doing ollies and flip tricks. It doesn’t catch like other materials. The suede on this shoe comes double stitched for extra durability and resistance to wear, making these one of the most durable skate shoes. The shoe is also made with a rubber outsole (similar to a vulcanized one) for optimal grip and flexibility. This is combined with the STI foam, which means you’ll have great board feel and cushioning when using these shoes. Check them out on Amazon.com for more pictures. You can expect great board feel and impact protection with these shoes. Not a combination you’ll see with most other shoe brands. However, they are a bit on the pricey side. Whilst they will outlast a ton of shoes, they simply may not be an option if they don’t fit your budget. Check out my list of cheaper shoes to see if they may work for you. The first cupsole shoe on my list. Emerica is a popular brand based in … America, who would have guessed. It’s owned by the parent brand “Sole Technology Inc.” who also own Etnies and eS. The Dissent is a shoe designed to be both lightweight and durable. It features a cupsole which greatly increases its durability. The cupsole is tougher than the vulcanized sole and can take more abuse so it typically lasts longer. However, it does tend to be inflexible, doesn’t provide the best board feel and makes the shoe feel stiff. So I only recommend these shoes to people who wouldn’t mind the above. That said, the shoes are pretty good for wider feet, even as the cupsole doesn’t break in as easy. If the cupsole simply isn’t for you, check out the Mikey Taylor vulcs below. Finally, the shoe is made with a leather toe-cap to protect against abrasion when you do your flip tricks. This toe cap allows the shoe to last a lot longer than it would without it. The rest of the upper material is suede which is double stitched, ensuring it will hold just as long as the toe cap does. Take a better look at these shoes here on Amazon.com. Coming in hot from DC, we have one of the many Mikey Taylor shoes. Whilst there are many variants available, we’ll be talking about the vulcanized sole version. The shoe is made up of both leather and fabric. The leather makes up the bulk of the shoe and ensures its durability. Leather has excellent resistance against wear and abrasion so it can withstand the abuse of being dragged along grip for a long time. The shoe also features “piping” and double stitching along some seams. The piping protects the stitching threads from getting torn when you do your flip tricks. Ensuring the stitching will be unaffected. The double stitching ensures your shoe stays together even if the stitching is scratched on some parts, acting as a fail safe. Finally, the vulcanized construction comes with a strong outsole that can withstand the force of impacts. But still being flexible and providing that necessary board feel. The shoe is amongst one of the among most comfortable skate shoes and is wider than other shoes. It’s a great option for skaters with wide feet or those who want to wear it as a casual shoe as well. Check out the range of colours and options for these shoes here on Amazon.com. These shoes are iconic and have been in the game for a while. I think they are the best high top skate shoes and I’ve personally gone through a couple pairs. These shoes come made with a variety of different materials. You can pick from suede, leather, and canvas. The classics, however, are made from a canvas and suede combo – the suede is on top of the shoe whilst the canvas is layered on the bottom, reinforcing it. However, they don’t last very long as your grip tape can chew through the thin suede quickly. I recommend you go for the more expensive leather option if possible. Or choose the adidas matchcourts as they have more resistant material. The shoe features a vulcanized skate sole with the signature waffle tread on the bottom. Surprisingly, this sole lasts a long time and can take the abuse of foot braking whilst still being thin enough to provide a ‘medium-ish’ board feel. The shoes are one of the best for ankle support due to their padded high top ‘collars’. They are stiff enough to keep your ankles in place whilst also protecting them from impacts and abrasion. These shoes should be a serious consideration for you. Check out the various options of it out on Amazon.com. Another quickly identifiable classic. These shoes are popular and for good reason. They’ve been around since the 80s and it’s hard to beat their timeless style. In my opinion the superstars are the best adidas skateboarding shoes. They feature the ADIPRENE insole which is pretty special. These soles don’t feature on all adidas shoes but make the difference when they do. They provide surprisingly good comfort and impact protection given how thin they are, meaning they don’t limit board feel at all. Some skaters even swear by them and keep buying the superstars because of it. However, it is reflected in the price and shoes that have it cost about $10 more. The shoe also has all the necessary features for a good skate shoe. Double stitching, a durable upper leather, and suede combo, a unique shell toe cover, and a vulcanized rubber sole for the maximum board feel. Check them out on Amazon.com to see all the options available. The one flaw of the shoes is how quickly the laces break. They don’t have adequate protection and cut if you keep doing flip tricks. If lace protection is important to you, check out the Nike Janoski’s above, for a similar option with better lace protection. These shoes are perfect if you want the same durability and similar performance as the Superstars above, but want it in an adidas high top package. These shoes are built with skateboarding primarily in mind – they even have the classic adidas stripes in synthetic leather to ensure they last as long as the shoe. They are made with a seamless toe cap that transitions into a suede toe and lace area. The suede is appropriately used here and it transitions into a canvas upper. The canvas keeps the shoe lightweight and breathable, whilst the suede takes the abuse of sliding across your grip tape. This makes the shoe durable, but also lightweight and flexible. At the ankles, the shoes stiffen and offer some of the best ankle support. Finally, the shoes are already pretty flexible and thusly don’t really have a break in period. You just put them on and simply get on with your skating. Check them out on Amazon to find out more about their pricing and color options. All in all, these are really stylish shoes that will last a long time. However, they are on the expensive side. Check out the Vans hi-tops above for a more affordable option if your budget is tight. Based on the iconic Vans shoes. These shoes have been upgraded to match the abuse of skateboarding and are the best vans skate shoe. (P.S the Pro in the title means they are actual skateboarding shoes). The 112s come with an extended outsole that acts as a toe cap. The outsole tracks around the whole shoe and gives a layer of extra protection. The shoe is then made with suede instead of the traditional canvas. This makes it more durable and allows it to last longer against abrasion, unlike the canvas. Like all other good skate shoes, these shoes also have double stitching, keeping your shoes from falling apart if you happen to chew through one layer. The shoes feature the classic Vans waffle sole, but it is slightly thinner and flexible. This is because the shoe is made with their ‘Vulc lite’ construction to allow for more board feel. However, they don’t feature any protection for the laces, so don’t be too surprised if they get torn as you use them. They can also run a bit small for some people, it’s recommended you buy a size larger just in case. Check out the shoes on Amazon to find out more. Another iconic Vans shoe. The half cab has a been a proven model for skateboarders. Designed by legend Steve Caballero, it’s been among the most iconic & popular vans of all time. The only mid-top on my list. This shoe features a few upgrades from the original half cab model. It has a slightly extended outer sole which is made from ‘duracap’ reinforced rubber. This rubber is said to be really durable and doesn’t wear as fast as soles on other shoes do. The material used above the sole is a suede and canvas combo. The suede features on areas of high abrasion like the toe cap. Whilst the canvas is placed on the upper and middle part of the shoe – where breathability and flexibility are needed. Finally, the shoe features a vulcanized construction with an ‘UltraCush’ insole. The insole is thin enough to provide excellent board feel but thick enough for optimal impact absorption. You can check out the rest of these shoes features on Amazon.com. The shoes work fairly well for skating, but the material they use tends to wear out easy. If you use them as casual shoes, the worn outlook may not be presentable. If a great casual shoe is what you’re after, check out the DC Mikey Taylors. Designed for those low maintenance skaters. These shoes are the only slip ons on my list and are pretty basic. They aren’t as susceptible to wear as the other shoes on my list because they don’t have many vulnerable parts. The shoes don’t have laces so you don’t have to worry about ripping and having to replace them. This is useful as cutting laces is a big issue for a lot of skateboards. The flipside is that you can’t really tighten the shoes so you’re stuck with how they fit. The shoes also don’t feature all the stitching other shoes have. You don’t have to worry about ripping and opening any seams. However, it can get hot in this shoe. This is because it doesn’t have holes or canvas over the top part of your feet for breathability. The entire shoe is made with suede, with canvas only on the sides. This slip ons are unique so it’s difficult for me to recommend an alternative to my list. You either like them or you don’t. Still, the Vans are the best slip ons and every skateboarder should experiment with a slip on once. Find out more about them on Amazon.com. Ahh the Blazers… Just as you would expect with anything from from Nike they’re high quality good looking and expensive. The Blazers are higher profile Nike shoe and they cover your ankles well. They follow a similar design to iconic Nike Air Jordans and borrow a lot from them. The shoes are just as comfortable and but offer more movement as they are mid tops. They still offer good for ankle support and protection, even given how low they are. The shoes feature a vulcanized construction, meaning they offer great board feel and are relatively flexible. Nike then paired this with a Zoom Air lining on the heel, for superior response and comfort. The shoes are made from a combo of double stitched suede and leather. The suede is also layered to help protect the shoelaces. Find out more about these shoes here on Amazon.com. These kicks are pretty iconic and work well as either skate shoes or casual shoes. However, they will set you back quite a bit. For a similarly iconic shoe and slightly cheaper shoe, check out the high top converse or the adidas matchcourts. Nike and pro skater Stefan Janoski came together to make an acclaimed skate shoe. Released in 2009, this shoe has gained notoriety in the skate community as one of the best Nike sb shoes. The shoe is primarily designed to provide excellent grip and board feel whilst being as light and as strong as possible. To achieve this, Nike built the shoe with a low-profile vulcanized rubber sole, with a waffle-like tread on the bottom. The rubber sole sticks to your grip tape well and helps the waffle-tread to provide extra grip. Whilst the low-profile vulcanized sole provides superior board feel, meaning you’ll know where you are on your board at all times. Even though the sole is pretty thin, the shoe absorbs impacts pretty well thanks to its Nike Zoom Air liner. Find out more about them here on Amazon.com. I’ve found them to be some of the most comfortable skate shoes, but some of my friends have complained that they are a bit narrow and tight. They may not be the best choice if you happen to have wider feet. Check out the DC Mikey Taylor below as they are a tad bit wider than these. The last shoe on the list and the most popular adidas skateboarding shoes. The Busenitz need no introduction. 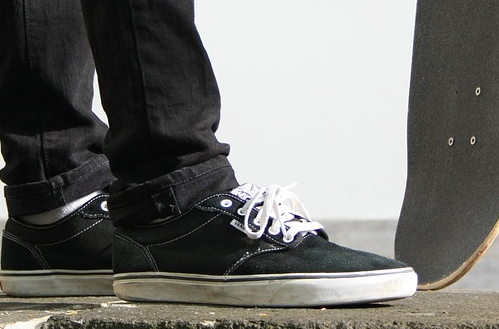 These shoes are both popular within the skateboarding market and outside of it. Featuring some unique tidbits that have gone into its construction. Built with a cupsole construction, these shoes offer less board feel but are a bit durable and stronger than their vulcanized counterparts. The sole is even skate-specific and has an indent to protect the stitching. That said, the construction means the shoe will be difficult to break in – it will be really stiff initially before softening up with time. The sole isn’t that grippy, which might be nice for some skaters, but not for others. The suede on the shoe has double and even triple stitching on some sections. This paired with the additionally layered suede means the shoe is built to take abuse. The laces even have a layer of suede to protect them at the most vulnerable points. Check out all the features this shoes have on here on Amazon.com. How to pick the right skate shoes? Can you skateboard with any type of shoes? Technically yes. You can jump on a skateboard wearing any type of shoes you want. However is it advisable? No. Skate shoes are designed in a certain way so they can work best for skateboarding. They are designed to provide excellent board feel, good grip and a good sliding ability for doing flip tricks. They use specific materials so you can get the best performance and durability for each aspect. rders to use a ton of resources to develop their pro skate shoes. Basically, if a popular skater can design the best skate shoe and put their name on it, a company stands to make A LOT of money. If you skateboard with the wrong shoes you will simply have a poor skating experience. Your shoes will rip quickly, you won’t be able to feel the board and you’ll really feel the impacts of landing hard. It’s simply better to invest in products designed to enhance your experience. The best material for skate shoes? Canvas – The cheapest of all the materials. Canvas is naturally breathable and is great at keeping shoes cool. However, it rips fairly easily. It’s best used on the upper part of the shoe to keep it cool and safely out of harm’s way of getting ripped. Suede – Suede is the best all-round material. It last long against abrasion/your skateboards grip tape and isn’t sooo expensive. However, it’s not very breathable and fully suede shoes usually get hot quickly. Leather – The most expensive but longest lasting material. Leather has excellent abrasion resistant properties. It’s why it’s used on motorcycle jackets to protect them when they fall over. However, it is costly to use and manufacture. Leather skate shoe are usually expensive. Synthetic Leather – This is a bit harder to come across (and is a good option for our Vegan friends). Not all brands use good synthetic leather, so you’ll have to do a bit of research to see if a shoe is durable enough. The right skate shoe combines all the above materials in one way or another. Using too much of one material can have its disadvantages, but mixing and matching usually allows you to get all the benefits without any drawbacks … except maybe the cost. Finally, remember the type of skating you’ll be doing. If you aren’t going to be doing tricks and scraping your shoes against the grip. You can get away with canvas shoes for skating. Likewise, if you’ll be doing a lot of heavy-duty skating, leather or suede will be the way to go. Stitching is a very much important part of the skate shoe. It essentially holds the whole package together and prevents your shoe from falling apart. You’ll notice double and triple stitching on key areas of the shoe. Stitching the same spot more than once reinforces it and provides extra support. This is especially necessary where the shoe is vulnerable to blowouts, will experience high impacts and where you’ll be doing the kickflips from. It increases the number of times it can stand up to these stresses – ergo increasing your shoes durability. Does the construction of the sole matter? This is a rubber sole that is basically glued to the rest of the shoe. It uses a process that is more effective and stronger than basic gluing. It allows for a thin, flexible piece of rubber to be stuck to the shoe to act as a sole. Because they are thin, they are easy to break in, provide a better board feel and are relatively inexpensive. However, they don’t protect your heel that well and don’t help absorb shock either. The cup sole is generally a bit harder to manufacture and were designed with skateboarding in mind. They are basically made up of two parts. The first part is the actual shoe and the second, a sole sewn on to it. Manufacturers and brands can put whatever special material and features they want to between these layers. For example, Nike puts their Air Zoom cushioning system in the heels of their skate shoes. As such, cup soles are known for being more protective and supportive. They are better if you are going to be doing big tricks down stairs and gaps. They protect your heels and help absorb force. However, they are stiffer and harder to break in. They don’t offer a lot of board feel and tend to be more expensive than their Vulc counterparts. Thinner, flexible shoes mean you can run looser trucks and still be in control of your board. The thinner soles mean you can feel every twitch from your trucks and have optimal control. Thicker, stiffer shoes are better for tight trucks. The thicker shoes give you more leverage over your board so you can skate tight trucks and still feel like you can turn easily. However, they don’t allow you to feel a lot of what your trucks are doing, making it hard to skate loose trucks. It’s just a theory that I’ve found through my skating experience, but it is really interesting. If you have different pairs of shoes available you should test it out for yourself. They really make a difference for for longboarding as well. How can you make your skate shoes last even longer? Shoe Goo – Shoe goo is basically a really versatile glue product. The glue itself can be applied to anything and it solidifies over time. Skaters use this glue by applying it to holes in their shoes to temporarily repair them … and it works! It’s not a long-term solution but is perfect to tide you over until you get your next pair of shoes. Check out how it’s used in the video below. Shoe goo is fairly cheap and really easy to use. Every skater should have it as an accessory. Brake soles – This is a nifty invention by our friends over at the luging/longboarding community. You basically stick a rubber sole onto your shoe. Shape it into your shoes shape (so it looks all neat and nice) and use it to foot break. You basically wear down the rubber and your shoe remains looking new and nice. Once the rubber wears out, you can simply replace it with another. Your shoes will end up lasting much longer than they ever could without them. Which shoe caught your eye? All the shoes on my list are there for the reason. They are some of the greatest skate shoes of all time. You can’t go wrong if you pick any of them. That said, if you’re sitting on the fence a great beginner shoe is the adidas Superstars. They are pretty simple shoes that can be worn casually too. So hey, if you end up not liking them, you have something stylish you can use outside the skatepark.